As investigators sifted through the rubble of a group home where a fire killed 10 people, questions were raised about why a convicted felon was hired as the operators' executive director, what caused another fire at the facility two days previously, and whether fire-code violations at a sister home three years ago had any connection to the latest blaze. 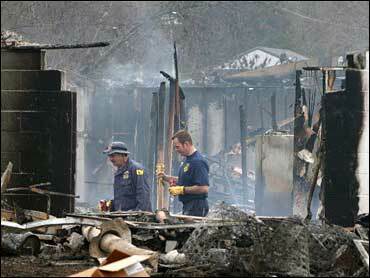 Investigators expect to rule out arson as the cause of a fire, a police spokesman said Tuesday. Sgt. Jason Clark of the Missouri State Highway Patrol said he did not "foresee that something through the night will lead us to believe that this is an arson investigation." Clark said authorities do not have any suspects or persons of interest in connection with Monday's blaze at Anderson Guest House. He declined to answer any other questions about investigators' findings. The operator of the home has been cited in recent years by the state of Missouri for the "most severe" violations of fire laws in two other facilities it runs, details CBS News chief investigative correspondent Armen Keteyian. "We're not saying it is definitely a crime scene, but we are treating it as if it is and trying to determine if the fire was set by somebody who had a nefarious motive," Gov. Matt Blunt said. The group home is operated by Joplin River of Life Ministries Inc. Robert Joseph Dupont, the ministries' executive director, issued a statement Monday expressing sadness and saying all displaced residents were being cared for with the help of local agencies. Dupont, 61, was convicted of conspiracy to commit fraud in 2003 for his part in a scheme to bilk the federal Medicare program by steering patients from group homes he owned — including the one in Anderson — to hand-picked doctors. Those doctors, in exchange, falsely certified that the patients needed home health services from two companies Dupont owned or co-owned, according to federal records. Dupont was sentenced to 21 months behind bars, followed by three years of supervised release. Earlier this year, a federal judge rejected Dupont's efforts to persuade the court to vacate that conviction. Dupont was listed as a ministries' officer in the group's 2002 articles of incorporation. As a convicted felon, he is not allowed under state law to hold such a position with a long-term care facility, Gonder said. Investigators interviewed Dupont and group home residents, including some survivors. A ministries employee said Dupont was unavailable for further comment. Authorities were also trying to determine if the blaze was linked to a smaller fire at the facility Saturday morning, Assistant Fire Marshal Greg Carrell said. No one was injured in that fire, which was still under investigation when the second blaze began. Inspectors from the Missouri Department of Health and Senior Services, which licenses the facility, found some deficiencies at the home in March but none related to fire safety, agency spokeswoman Nanci Gonder said. The home is a residential care center that is licensed to allow mentally ill residents to live at the home and receive treatment elsewhere. The home had fire alarms but no sprinklers. The dead ranged from their early 20s to elderly. Eighteen people were taken to hospitals and six were treated at the scene. Inside the home were 32 residents and two employees — a husband and wife — when the fire was reported, highway patrol spokesman Kent Casey said. Two dozen people were injured. One was in serious condition Monday evening. All the other survivors were either in good or fair condition or had been treated and released. Neighbor Betty Wood heard the screams and ran out to help. "You could just tell they were in shock. They just couldn't get their eyes off the fire," she told CBS News correspondent Lee Cowan. The Missouri Mental Health Task Force issued a draft report last month demanding far more protection inside all homes for the mentally disabled. The chief concern was the state's failure to follow its own rules in supervising operators of those homes, Keteyian reported. In October 2003, another group home operated by Joplin River of Life Ministries was cited for fire-code violations, including intentionally disabling fire equipment, records show. The 12-bedroom residential facility in Joplin, known as Guest House II, "failed to repair a malfunctioning fire alarm system for at least two weeks and did not implement a fire watch during that time," according to an Oct. 23, 2003, memo by the health department's deputy director for long-term care. A copy of the document was provided to The Associated Press by the Missourian Coalition for Quality Care, a Jefferson City-based nursing home industry watchdog. Employees also "placed a pencil in the reset switch to prevent fire alarm activation and failed to reset two pull stations," the health department memo said. A state investigation report indicates no one took responsibility for the broken fire alarm. The administrator claimed not to have been notified about it; the facility manager claimed to have reported it three or four weeks earlier to the maintenance person; and the maintenance person claimed to have been notified only on the day of the inspection. Gonder said that facility closed on July 15, 2004. But Joplin River of Life Ministries continues to operate three group homes in Joplin and a fourth in nearby Carl Junction. State inspectors also cited a ministries' group home in Carthage in October 2003 for failing to obtain a required annual fire inspection and being unable to ensure that staff members could unlock rooms from the outside in case of emergency, the Joplin Globe reported.